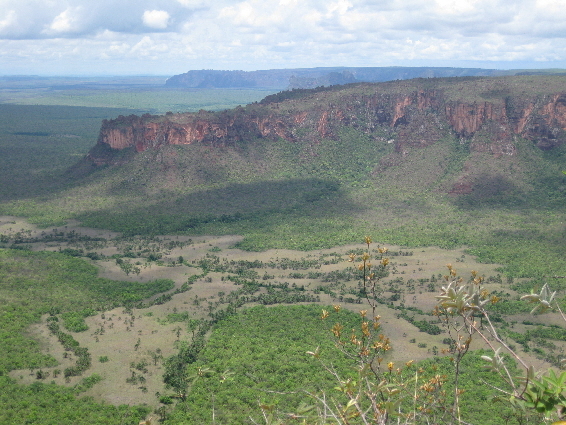 Chapada dos Guimarães is located roughly 100 km northeast of Cuiabá, the state capital of Mato Grosso. These highlands of Brazil invite you to hike in the endless landscapes and bath under refreshing waterfalls. Once you reach Cuiabá the easiest way to reach Chapada dos Guimarães is by renting a car or contracting a private transfer. The road is in pretty good conditions and a second lane is currently under construction, making it pretty easy to reach the city of Chapada dos Guimarães. The city itself is pretty small, though the area of the National Park is raither extend and has several attractions, including waterfalls, caves, canyons, rivers and lagoons. When planning a trip try to avoid the first few months of the year, when the rainstorms tend to be heavier. Due to the location up in the highlands the winters (June-August) tend to be colder and the night time temperature may dropp close to zero degrees, something that may prevent you from enjoying a bath under the waterfalls. Therefore some of the very best moments to visit Chapada dos Guimarães are the months of May, September, October and November. 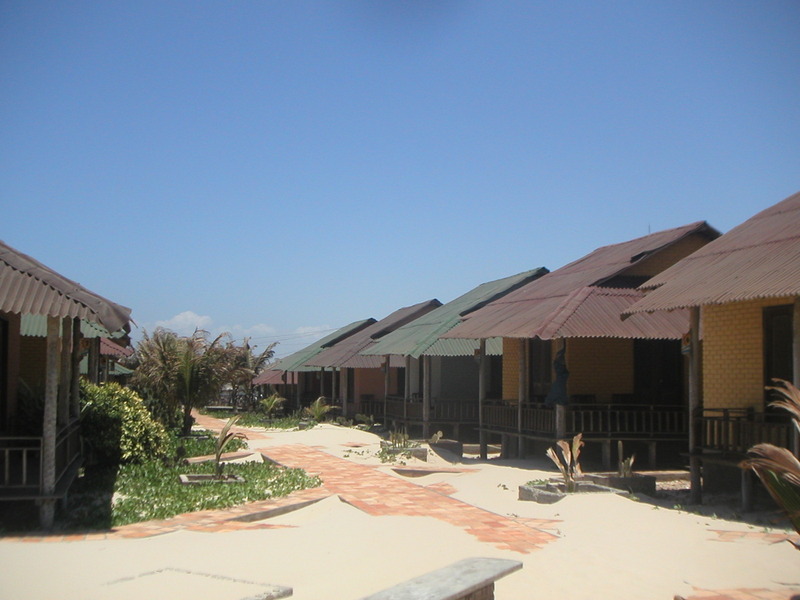 Get accommodated in the heart of the village and fill your days with excursions. One of the principal tours takes you to the numerous waterfalls of the national park, allowing you to have a refreshing bath under them. This full day excursion will also introduce you to the endless landscapes and rich vegetation of Chapada dos Guimarães National Park. The tour includes also a visit to Veú de Noiva, the highest waterfall of the region with a breathtaking viewpoint next to it. 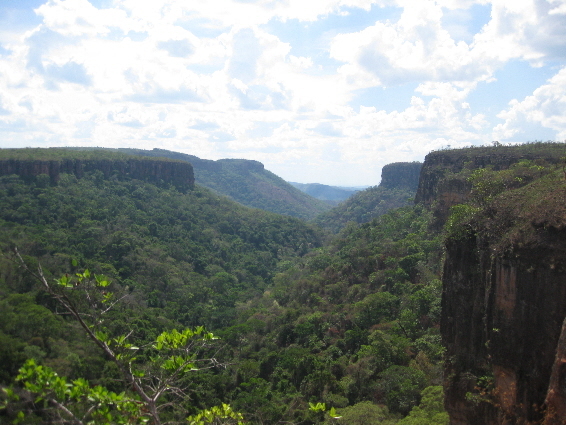 Another interesting day trip takes you to the valley of Rio Claro surrounded by huge canyon walls. You will have a chance to admire the green landscapes of the valley, bath in the Rio Claro river and observe the sign language of indigenous tribes in the rocks. 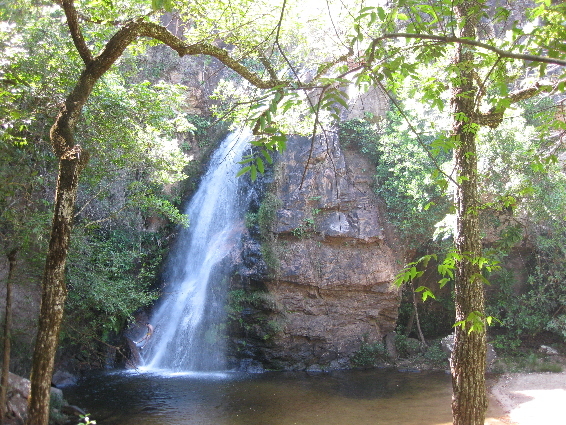 Beside of these two principal tours organized in the national park, you will find a number of other attractions such as the waterfall of Martinha, located about 40km outside of the city. This waterfall is a popular bathing place among the locals, especially during the weekends. On your way back to town stop at the viewpoint and admire a spectacular sunset from the top of it. 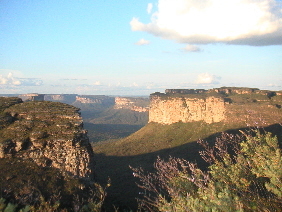 Chapada dos Guimarães is also a popular destination for adventure tourism. If you are into trekking, challenge yourself with the trail of São Jerónimo. Wonderful views from the top of it (836m) make it worth hiking. In Chapada dos Guimarães you will also have a chance to practise rappeling under a waterfall or light hiking for example in so called dinosaurus valley known for its’ strange rock formations. At the moment there are few attractions that are closed due to either political reasons or lack of security. 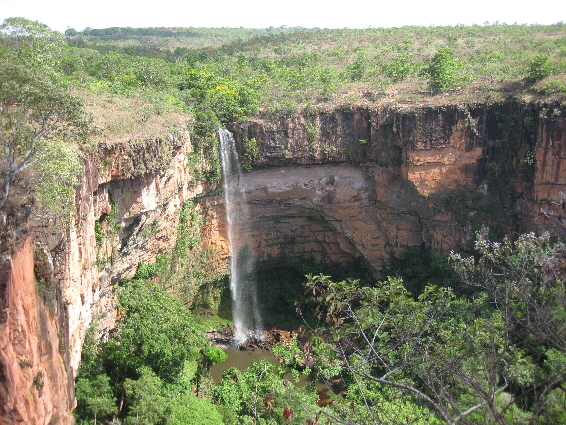 Among them are some of the principal sights of Chapada dos Guimarães like Cidade de Pedra (city of the rocks), the canyon of Paredão do Eco, cave of Aroe Jari and the Blue Lagoon (Lagoa Azul). When you travel to Chapada dos Guimarães check out the latest updates conserning these sights and set up of visit if possible, as the views from both Paredão do Eco and Cidade de Pedra are one in kind, while the cave and the lagoon are also certainly worth visiting. Pousada Villa Guimarães – An outstanding tourist class pousada in the heart of the city. 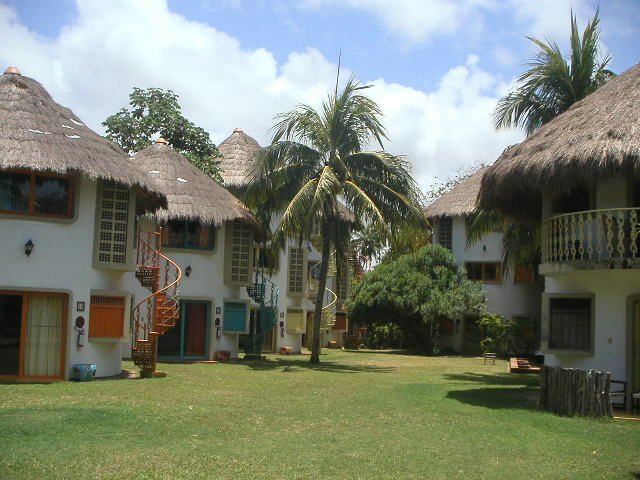 Spacious rooms, excellent buffet breakfast and hospitable owners. Great value for money! Pousada Solar do Ingles – A lovely pousada surrounded by tropical gardens and decorated with the traditional English style. A great choice for a traveller looking for cozy, but stylish accommodation with number of details. Restaurant Peixaria do Nelsinho – A fish restaurant with long traditions, remember to taste the smoked fish, the speciality of the house. Restaurant Som da Oca – A simple restaurant in the city center with tasty food and great value for money. Restaurant Bistrô da Mata – A sophisticated restaurant in the middle of the nature with great views. An excellent place to enjoy both the atmospheare and the dinner. 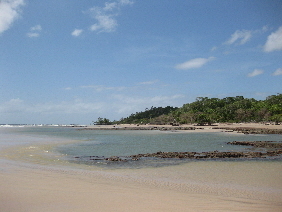 The village of Cumbuco is located only about 35 km from Fortaleza to north. It enjoys an easy and quick access either from the international airport of Fortaleza or from the center of the state capital. Cumbuco is a small holiday villages with large number of pousadas, resorts and residencial apartments. It’s a destination for a traveller who wants to enjoy the cozy atmospheare and in the meanwhile be close to a major city. 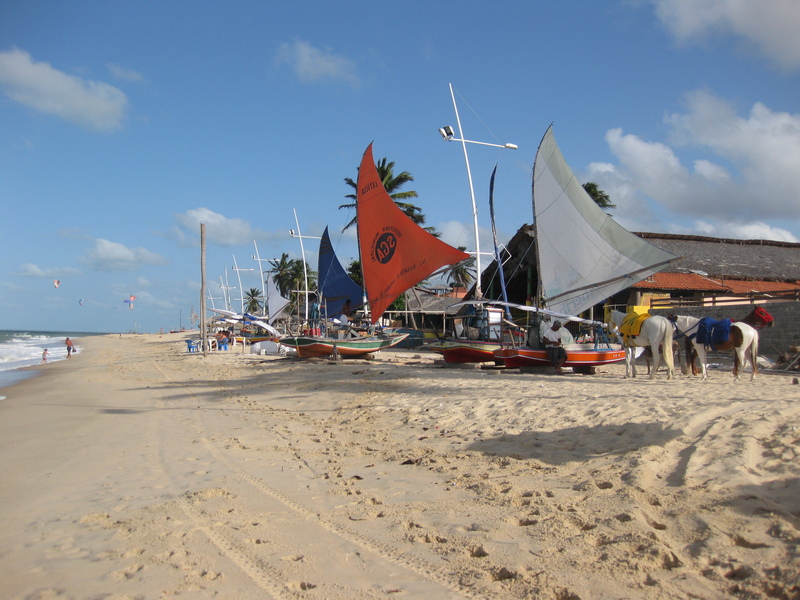 Cumbuco is an extremely popular kite surf destination and therefore receives a large number of tourists from all over the world. The second half of the year is the best moment to enjoy the never ending winds of Ceará. If you are not an active kite-surfer take a basic course and get familiar with this facinating water sport. Beside of kite-surf enjoy the beaches of Cumbuco and visit the nearby fresh water lagoons out of which Lagoa do Banana is the most popular one and perfect for water activities, sunbathing and fun. 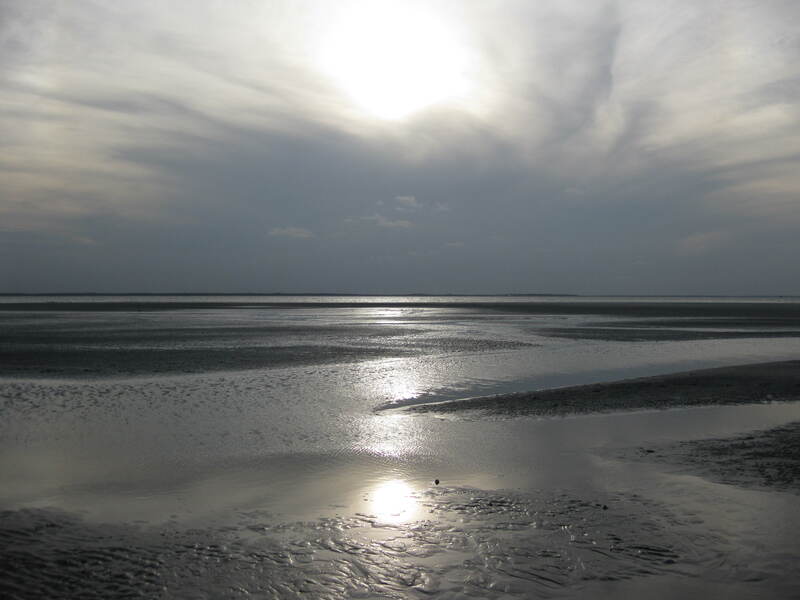 Before the end of the day take a buggy drive over the dunes and admire a spectacular sunset from the top of them. If you are into longer day trips, a buggy drive along the coast takes you to other beach side villages, including the picturesque beach of Lagoinha. Cumbuco is not a hideaway, it’s raither a destination for an active holiday maker who enjoys the leisure activities and infrastructure offered by this small village. I would say Cumbuco is an excellent destination for two types of tourists. First of all the lovers of water sports, especially kite surfers. Thanks to them Cumbuco has a very young spirit and vibrating night life every single day of the week, from Monday till Sunday. Secondly families. Quick access from the international airport of Fortaleza and excellent infrastructure with quality resorts and all inclusive options attracts families to spend their beach side holiday in Cumbuco. 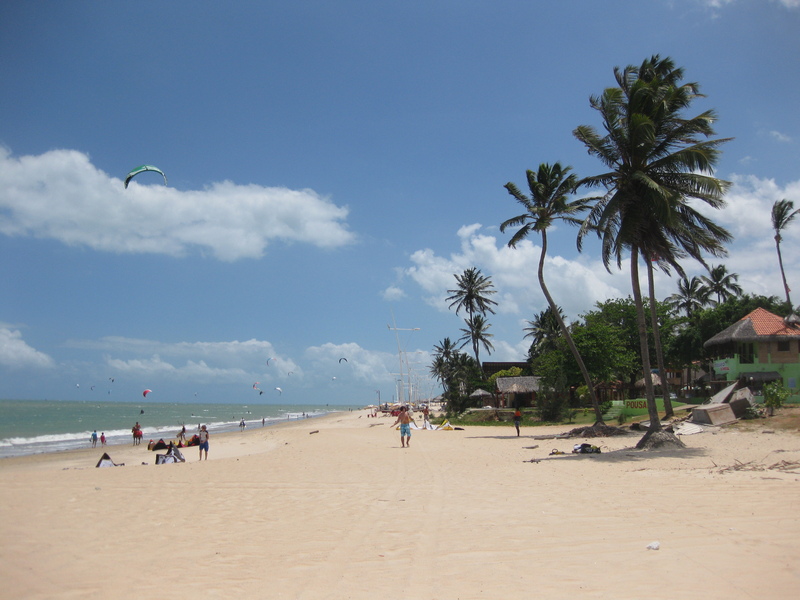 Cumbuco is a mixture of comfort and hospitality right next to Fortaleza. Dunelodge 0031 – A lovely pousada next to the immense dunes and just few hundred meters from the beach. Decorated with good taste Dunelodge 0031 offers hospitality and excellent value for money. Bar & Restaurant 0031 – A place for you to enjoy yourself during the evenings. Bar & Restaurant 0031 offers an interesting menu, good music and cozy atmospheare for you to get relaxed. Laranja Mecânica – When the night falls the party is guaranteed in Laranja Mecânica, a beach side bar with contemporary pop music. 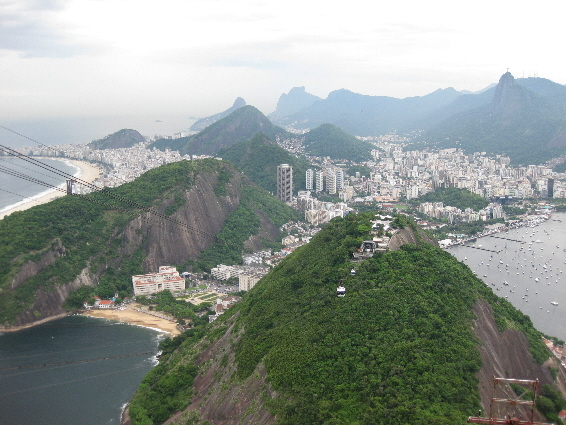 Climate: Avoid the rainy seasons and find the best time to visit each part of Brazil. Long time ago I promised to write about the seasons, but as there are so many interesting topics I totally forgot my intention to dedicate an entire blog post only for seasons. However this issue came up again sometime ago when I was wishing that central Brazil would get some heavy rains to extinguish the forest fires. word there is no way to forecast all the climatical conditions and their consequences for the nature. This is exactly what happened in case of central Brazil as well. 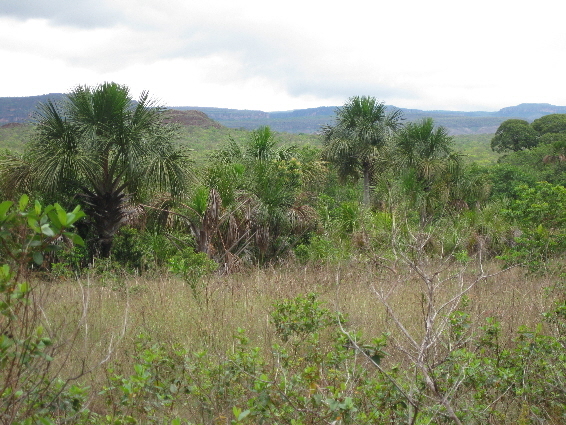 Basically the dry season is the best moment to hike around in such National Parks as Chapada dos Guimarães (Mato Grosso) and Chapada dos Veadeiros (Goiaís). However the extremely dry season with no rain at all for many months can cause several forest fires and damage these conserved areas. This is exactly what happened with Chapada dos Guimarães. Anyhow none of us enjoys travelling during the rainy season, so this is basically one of the most important things to take into consideration when planning a trip. During the rainy season the northest part of Brazil receives heavy rainfalls and just like the northeastern coast may also suffer intense floods. Naturally you don’t want to book a beach holiday if the probably of raining cats and dogs is pretty much higher than a possibility of sunbathing. So, let’s take a look at the seasons. In the northern Brazil (See Map) the rainy season starts at the end of the year and goes basically until May. This is when it’s not worth visiting such beach destinations as Ilha do Algodoal, Ilha de Marajó and Alter do Chão, or depending on the intensity of the rains practise outdoor activities in the Amazon region . The northeastern coast is the next one to receive the rains. The extreme north of it (Maranhão and Ceará) tend to suffer for heaviest rains between March and May/June. 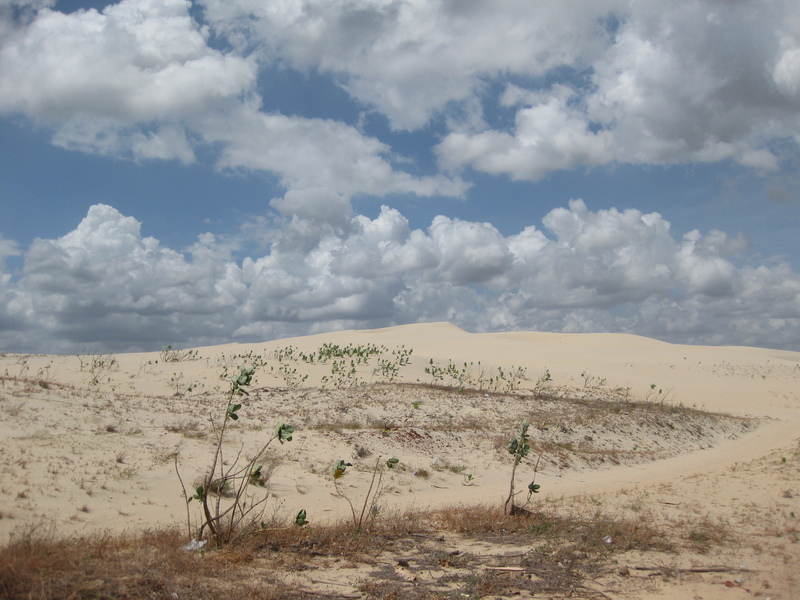 However there are some very dry coastal areas in Ceará (like Canoa Quebrada) with very low annual rainfall. Right after follow the states of Rio Grande do Norte and Paraiba with the rainy season basically in between April and July, while Pernambuco, Alagoas, Sergipe and Bahia tend to receive the highest amouth of rainfall between May and August. In the southern the end of Bahia the rainy season may extend until September. When we reach the states of southeastern and southern Brazil things change. Then the guestion is not just about the rainy season, but raither about the temperature. Yes, Brazil is a tropical country, but it’s also a huge country meaning that there are times when you simply cannot enjoy sun and the beaches in extreme south like Florianopolis or Balneario de Camboriu. During the winter months even Rio de Janeiro has a raither mild weather, which is not bad at all when it comes to a city-break, but if you are dreaming of hot days on the beach you may not get what you are looking for. In this region the highest rainfall usually occurs during the summer months, which naturally are the hottest and the most humid months as well. There may be some days with heavy rains, but a typical summer rain in Rio de Janeiro tends to be a strong thunderstorm at the end of the day, something that really doesn’t deter you from having a perfect beach holiday. When it comes to eco-tourism destinations thing get even a little bit more complicated. Like I mentioned earlier the rainy season hits the Amazon region during the first six months of the year. 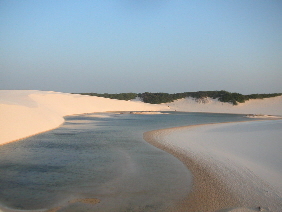 Other eco-tourism destinations that should be avoided during the beginning of the year are Chapada dos Veadeiros, Lencois Maranhenses, Pantanal and Jalapão. 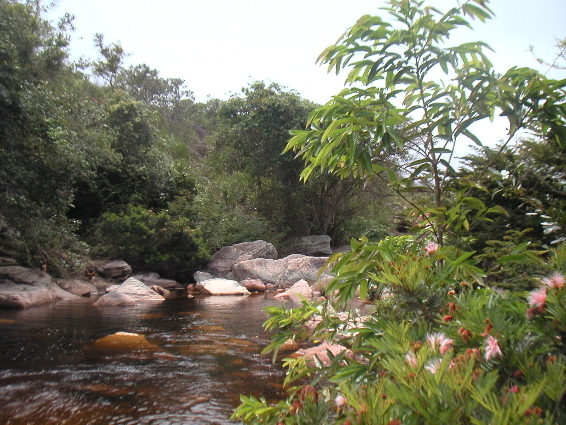 However when it comes to eco-tourism it’s highly recommended to visit these and some other destinations like Bonito, Iguacu Falls, Chapada dos Guimarães, Delta de Parnaiba and Chapada Diamantina right after the rains, when the level of water in the waterfalls is highest and the nature is very much alive thanks to the rains. For more details and full information about best travelling seasons check out our specific destination guide divided into Beaches, Eco-tourism and Culture. Many of the mayor Brazilian cities do have their colonial side with colorful buildings, mosaics and traditional architecture, however I would say that you haven’t seen colonial Brazil before you have seen Ouro Preto. 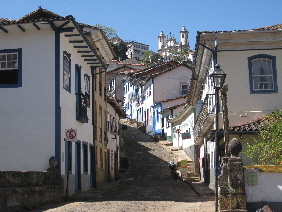 Ouro Preto is different, it’s unique, it’s a must see destination which will surprise you. What makes Ouro Preto so special then? Ouro Preto is not just a colonial old town with beautiful historic churches, Ouro Preto is an another Brazil that you will not find by visiting the well-known cities or beach destinations. After having seen a large number of less conserved cities in Brazil, what mostly impressed me with Ouro Preto was the consciousness of conservation. Without taking into account the entrance, even today the streets of Ouro Preto are made of stones and the new construction has to follow stricktly the tradional architecture. Here you will not see any modern high rising buildings netx to a lovely colonial house, no Ouro Preto is still like decades ago. Basically in the heart of city there is only one modern building. It happens to a hotel, designed by famous Brazilian architecture Oscar Niemayer. A little detail that can easily be forgiven. So once you walk in the narrow streets of Ouro Preto you can enjoy the atmospheare without running into any signs of modern construction. 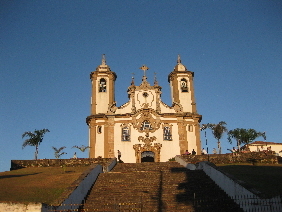 This fact gives Ouro Preto its’ special charm and attracts tourist both at national and at international levels. 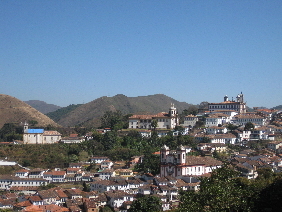 Ouro Preto enjoys an easy access from Belo Horizonte, the capital of Minas Gerais. The distance from the city is only about 100 km and a little bit more if you depart from the international airport of Belo Horizonte. The simplest way to reach this lovely town is to hire a private transfer unless you are not into renting a car and driving by yourself, which in fact is an interesting option as it allows you to discover the nearby cities such as Mariana as well. 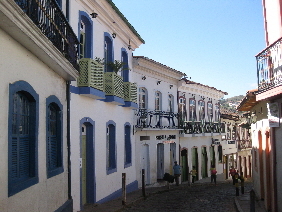 Once you arrive to Ouro Preto the best way to move around is on foot, but pay attention on the shoes you are wearing. Forget the high heals and any slippery shoes, as walking in the city means going up and down and up again. Also, make sure you get accommodated in the heart of the city which allows quick and easy access to all the attractions at any time of the day. Praça de Tiradentes, the main square of Ouro Preto is a starting point for your adventures in this colonial town. Visit the Museum of Betrayal (Museo de Inconfidência) to learn a lot about the history of the region. On the other end of the square stands the Museum of Mineralogy with varied collection of minerals from quartz to diamonds. 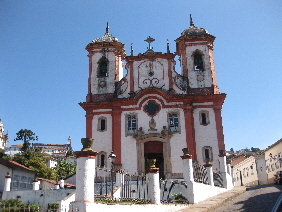 Ouro Preto has 13 traditonal churches dating from baroque and rokokoo eras. All of them are worth visited but if your time and interest is limited include at least the three most important ones into your schedule. They are city’s oldest church Igreja de Nossa Senhora do Pilar with almost 1000 pounds of gold and nearly 900 pounds of silver, Igreja de São Francisco de Assis which is a unique rokokoo church known as a masterpiece of Aleijadinho one of the most highly-regarded Brazilian artists. The museum and the grave of this famous painter, scupltor and architect are located at the church of Nossa Senhora da Conceição, also worth visiting. Aleijadinho suffered leprosy and the legend says that after having lost his fingers he c0ntinued working by strapping tools to his stumps. Beside of his talent this is one of the facts that makes his art extremely interesting and definitely worth admiring. 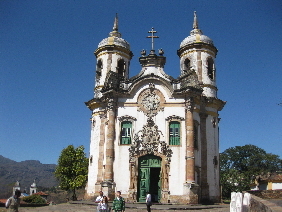 When planning your trip to Ouro Preto remember that most of the churches and museums stay closed on Mondays. 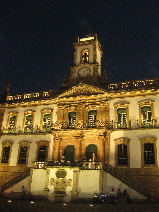 Ouro Preto means black gold, name that was given to the city due to the minerals (including gold) found from the region. Today, as a tourist, you can visit the mines which during the gold rush were the working place of hundreds and thousands of slaves. Narrow alleyways inside of the mine tell a cruel history of unhuman working conditions of the slaves, who made all the hard work not only in Ouro Preto but many other parts of Brazil during the slavery. Once you have visited the principal sights, wander around the pictoresque streets of Ouro Preto, take pictures and enjoy the unique atmospheare of this charming city. In case you are visiting Ouro Preto during the summer time visit the waterfalls of the region for a refreshing bath. When the night falls, Ouro Preto invites you to enjoy fine dining with live music. Jazz and Brasilian popular music (MPB) are the two principal rhythms heard in many restaurants. 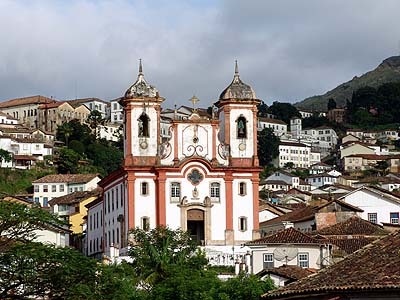 The offer of cultural events in Ouro Preto is pretty good and one of the most popular events is the festival of Jazz organized every year in September. However even outside of special dates you will always find a cozy place to enjoy a cup of coffee, a class of wine or a delicious meal while you listen to live music. On your next trip to Brazil, don’t miss Ouro Preto, it’s pure magic and easy to fall in love with. 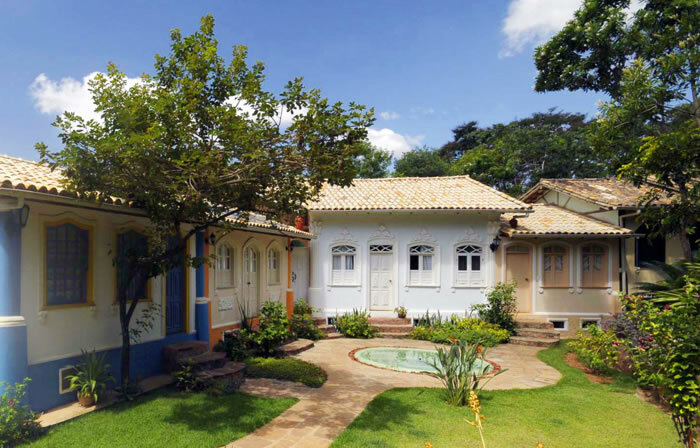 Hotel Solar do Rosario – The best hotel of Ouro Preto with top service and all the facilities. Solar do Rosario is well located in a peaceful corner of the city, next to the church of Rosario and just about 10 minutes walk from the main square. It offers high quality accommodation with colonial touch of Ouro Preto and all the possible services including meeting facilities, 2 pool (natural and heated one) and a gym. Highly recommended! Pousada do Mondego – A quality pousada next to the São Francisco de Assis church and just a block from the main square. Hotel do Teatro – A tiny hotel in a silent street just a step away from the main square. 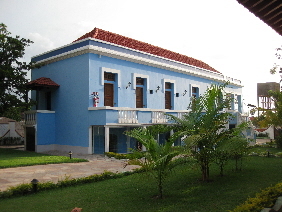 Rooms of Hotel do Teatro are decorated with traditional colonial style and it offers good value for money. Cafe Gerais – Tasty meals, ambient decorated with good taste and high quality live jazz in the evenings. An excellent place to enjoy your dinner together with couple of drinks. Restaurante Acaso 85 – Looking for a romantic ambient for special celebration? Then your destination must be Acaso 85, a restaurant that from outside doesn’t impress at all, but hides an extremely romantic ambient, with different spaces, one of them an open air garden with candle light. Highly recommended! Casa do Ouvidor – A recommended place for lunch or dinner. Taste dishes, good ambient and great value for money. Try especially the tradional meals from the region of Minas Gerais! O Passo – A pizzaria with a lovely terrace, for you to have a drink, light snack or a while while listening to live music in open air. Pousada, what is it and why should I stay in one? When you are planning a trip to Brazil, you will surely run into the word Pousada. What is a Pousada? What would be the best way to translate this word? Some may suggest “Inn” or “Bed & Breakfast”, however I do think that there is not an exact way to translate Pousada into English. 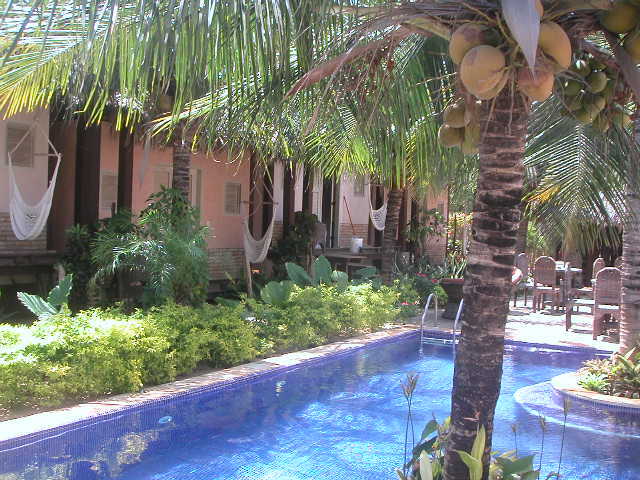 A brazilian Pousada is lot more than just an “Inn” and nowadays it covers more categories than a simple “Bed & Breakfast”. Traditionally a Pousada was raither a small family run business offering rooms for a traveller to stay overnight. Nowadays a Pousada can be anything in between a small but cozy and luxurious hideaway. The only thing that remains in the fact that Pousada still today tends to be a raither small place with personalized touch. When it comes to services Pousadas do not compete with hotels, even though nowadays many of them already offer such comfort as wi-fi access to the guests. 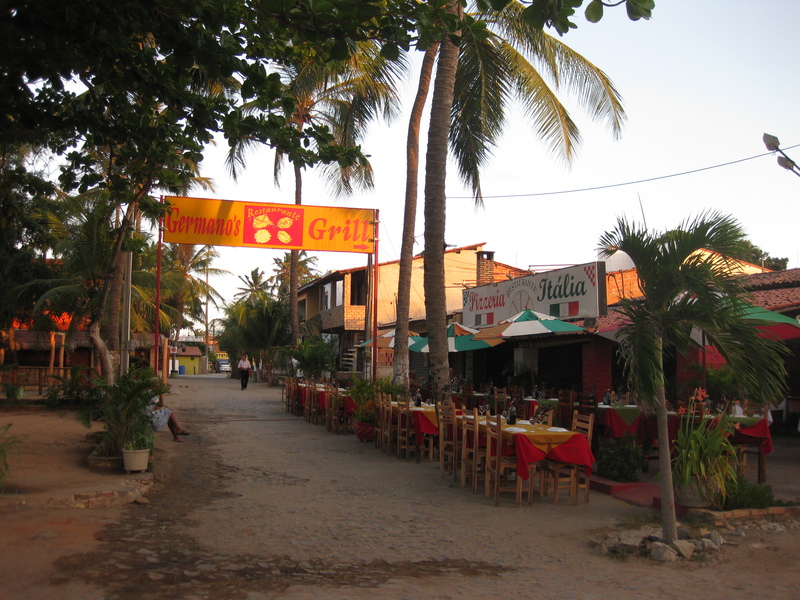 Pousadas are widely available in beach side locations and other smaller towns. 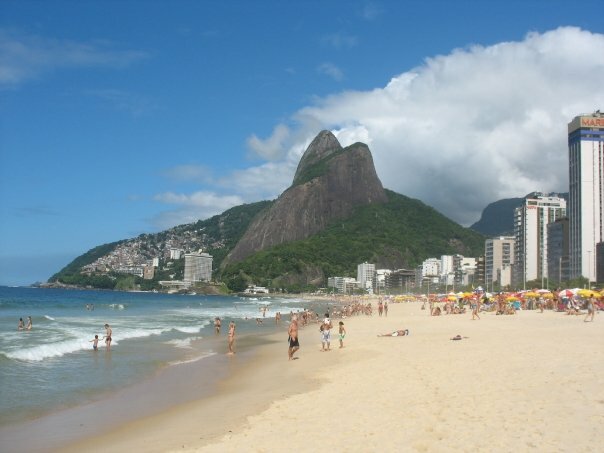 However you will find charming options also from bigger cities like Salvador and Rio de Janeiro. So should you stay in a pousada or opt for a hotel? Personally I’m in love with Pousadas. Especially in tourist class categories many hotels are lacking of identity and personality seeming to be exactly the same no matter in which corner of the earth you are. Of course you may think that you are not travelling to stay in a hotel, but on the other hand you might pay approximately the same amouth of money or in many cases even less. So why wouldn’t you opt for a Pousada, which can offer you a more personalized accommodation with local touch and character, and a lot more welcoming hospitality than most of the traditional tourist class hotels offer. Like I said a Pousada can be anything from a basic and economic accommodation option to a luxurious hideaway villa offering you ultimate comfort with privacy. Pousadas are often decorated with pieces of art and handcrafts, and offer at least a tasty homemade buffet breakfast for its’ guests. So now that you know, don’t hesitate in staying in a pousada. It is your home in Brazil, whenever you want to feel yourself welcome and experience the genuine touch of brazilian culture. Ask for Brazil Diversity recommendations!